Level 7 -- Fukushima vs Chernobyl -- How Do They Really Compare? ATCA was one of the FIRST global risk management organisation's to issue a RED ALERT on March 11th, the day of the Japan Tsunami, titled, "Red Alert: Nuclear Emergency In Japan." Since then we've been voicing our concerns in regard to the rapidly deteriorating condition within the four damaged nuclear reactors out of six at the Fukushima Daiichi Japanese nuclear facility in a number of subsequent briefings. So, to our distinguished readers and members, it should come as no surprise that Japan has raised the severity level of its nuclear crisis from five to the maximum seven, putting the emergency at Fukushima at par with Chernobyl in 1986. "The world media likes to focus on the potential of a nuclear meltdown at Fukushima's multiple reactors, including melted cores, exposed uranium and plutonium etc. In fact, the old fuel rods are much more dangerous than the nuclear meltdown scenarios because there is more radiation in the unguarded spent fuel pools than in the reactors themselves." "The Japanese nuclear crisis has the potential to be larger than Chernobyl because there are several tons of nuclear waste stored in the reactor cores that could be lofted into the environment in the event of explosion. Cracks are already there in the containment vessels of reactors one, two and three. If those cracks grow, or if there is an explosion, this could be something beyond Chernobyl, because of the various fission products being released into the environment." Where most attention has centred on reactors #1, #2 and #3, there is also concern amongst nuclear scientists about the separate spent fuel pond in reactor building #4. In the week following the tsunami, it became clear that the spent fuel rod cooling pond was running dry, meaning that fuel rods would soon over-heat. This meant the likely degradation, fire or disinegration of their zirconium alloy cladding. Zirconium at those temperatures separates water into oxygen and hydrogen, which as we have seen is highly explosive. By Tepco's own admission, there is a risk that then a nuclear chain reaction could begin spontaneously, the dreaded “inadvertent criticality”. This would mean that the potential for a very large atmospheric release of as much as 250 tons of radioactive fuel material sitting in that pond could then not be discounted. If that should happen, the drinking water, green leaf vegetables, and some of the food chain of the northern hemisphere could be potentially affected. If there were to be an energetic event, there would be a very large radioactive release indeed. The priority is, as it has been all along, to restore adequate coolant to stabilise and to reduce the energy release in the spent fuel ponds and the reactors themselves -- while hoping that earthquake aftershocks, bad weather and further power outages do not cause significant further delays. Experts say this accident may turn out to be much bigger and more destructive than the Chernobyl meltdown in 1986, labeled as history’s worst nuclear accident. The Japanese government has sought to calm the markets by downplaying what has really gone on at the Fukushima nuclear reactors. Today the Japanese prime minister said the situation is improving, even after the announcement that the threat level had been raised to 7. But it’s clear a nuclear power plant housing six separate reactors -- with four of them in trouble -- including several large pools holding huge quantities of spent fuel rods which are undergoing repeated explosions and sporadic episodes of nuclear fission could certainly dwarf the Chernobyl accident in size, complexity, danger and potential for long-term damage. Fukushima is much bigger than Chernobyl according to some Russian nuclear experts such as Natalia Mironova, a thermodynamic engineer, interviewed by Agence France Presse (AFP). The nuclear disaster at Japan's Fukushima power plant is "much bigger than Chernobyl" and could rewrite the international scale used to measure the severity of atomic accidents. Chernobyl was level seven and it had only one reactor and lasted only two weeks. We have now [four] weeks (at Fukushima) and we have four reactors which we know are in very dangerous situations," she warned. "Chernobyl was a dirty bomb explosion. The next dirty bomb is Fukushima and it will cost much more" in economic and human terms, she added, because of the urban population centres in its proximity. The fallout of radioactive Caesium from Fukushima already rivals Chernobyl. Radioactive caesium and iodine have been deposited in northern Japan far from Fukushima at levels that were classified as highly contaminated after Chernobyl. The readings were taken by the Japanese science ministry, MEXT (Ministry of Education, Culture, Sports, Science and Technology), and reveal high levels of caesium-137 and iodine-131 outside the 30-kilometre evacuation zone, mostly to the north-north-west. Radioactive caesium is one of the main dangers from the Japanese nuclear accident. Over the longer term, the big threat to human health is caesium-137, which has a half-life of 30 years. At that rate of disintegration it takes over 200 years to reduce it to 1 percent of its former level. It is caesium-137 that still contaminates much of the Ukraine area around the Chernobyl reactor which is designated as a dead zone. Caesium-137 mixes easily with water and is chemically similar to potassium. It thus mimics how potassium gets metabolised in the human body and can enter through many food chains, including cows grazing in the countryside and the milk they produce. The relatively low levels as defined in a glass of milk or a bowl of spinach are deceptive because this radioactive contamination is bioaccumulative, especially in mammals, and grows with each additional exposure over long periods of time.
. MOX is two million times more deadly than normal enriched uranium." "What if the release of elements in the smoke and vapour were not just radioactive iodine, caesium and uranium but a MOX combination including plutonium?
. Plutonium comes from Pluto: god of wealth and power and also the god of hell and death." While radioactive iodine and cesium (half-life 8 days and 30 years, respectively) are the most immediate threats to human health, one of the plants is leaking plutonium having a half-life of 24,000 years. The “safe” levels of radiation quoted by authorities are generally what would be experienced standing next to the hot isotopes, but if these are ingested the consequences are much more severe. If one millionth of a gram of plutonium lands in a human lung, the individual gets lung cancer. Plutonium along with other radioactive isotopes is leaking through tunnels to the ocean where it will be distributed locally by currents, concentrated in fish, and distributed world wide by migratory fish. What Does A Level 7 Mean? A level seven rating is defined as "An event resulting in an environmental release corresponding to a quantity of radioactivity radiologically equivalent to a release to the atmosphere of more than several tens of thousands of TeraBecquerels (TBq) of Iodine-131." One TeraBecquerel (TBq) equals one Trillion Becquerels of radioactivity. The Japanese Nuclear and Industrial Safety Agency (NISA) puts the Fukushima figure at 370,000 TBq of Iodine-131 equivalent; the Nuclear Safety Commission, which has a more over-arching role in the Japanese system, says 630,000 TBq. Either way, it's clearly beyond the threshold for classification as an INES -- International Nuclear Event Scale -- level seven event, although an order of magnitude lower than the 5.2 million TBq released from the Chernobyl accident, ie, only 10% of that radiation quantum so far. 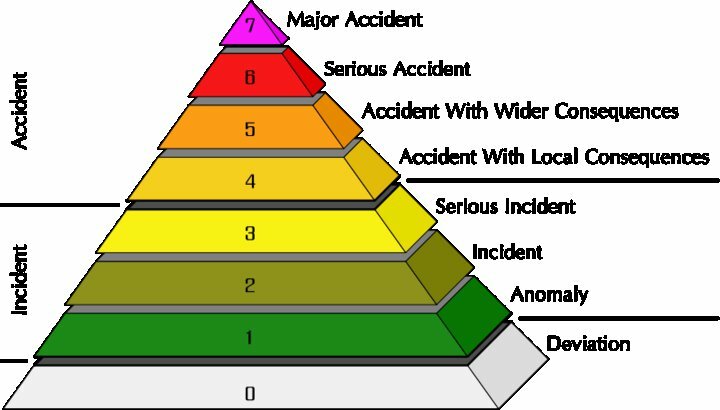 Level 7 is the most serious level on INES -- International Nuclear Event Scale -- describing "a major release of radioactive material with widespread health and environmental effects requiring implementation of planned and extended countermeasures." Although, by some measures, Fukushima has not reached the level of radioactive contamination caused by Chernobyl yet, we would advise caution because of the presence of plutonium and spent fuel rod pools with hundreds of thousands of tons of radioactive nuclear material. Even when we discount the Russian view and the caesium fallout levels rivalling Chernobyl, if things do not continue to go right, the potential exists for Fukushima to be much bigger than Chernobyl. The uniqueness and specificity of the Chernobyl and Fukushima accidents is such that posterity will remember the two events as being very distinct, although they both involve nuclear contamination.